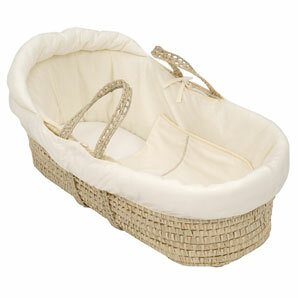 This charming and not so easy-to-find Moses basket makes it convenient to keep your baby close to you all the time. Let your baby be the center of attraction wherever you are – whether at home, when visiting a friend, in a picnic or anywhere on the go! Made of woven seagrass from Albay, this basket is lightweight and portable. Its leather handle straps (upon request) also make it easier for you to carry it from one place to another. It comes with washable cloth-covered padded liner, all-around cover and detachable hood. Best for newborns below 18 lbs. As your baby grows and outgrows the basket, you can convert this pretty basket into a toy bin, magazine/newspaper holder, storage for just about anything and everything!